A versatile 6/8 drum loops library with drum beats ranging from 70 bpm to 100 bpm, Drum Werks XXV delivers the 6/8 grooves and fills your songwriting arsenal needs to quickly build new drum tracks. Within the 6/8 time signature, you can dig into straight 8th beats, half-time grooves, shuffles, and other 6/8 groove styles. 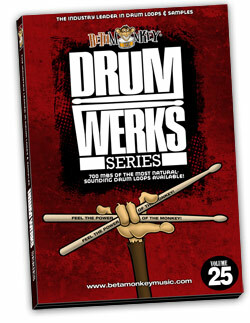 Drum Werks XXV is the only exclusively 6/8 drum loop collection available today. 263 6/8 drum loops, from 70 bpm to 100 bpm, for any uptempo 6/8 signature project. For rock, pop, RnB, alt songwriters. Bring those high-energy 6/8 drum tracks with Drum Werks XXV! Need to take your 6/8 drum tracks up a notch? With 263 up-tempo 6/8 drum loops ranging from 70 bpm to 100 bpm, Drum Werks XXV delivers a solid and versatile mix of 6/8 drumming. You get all the right grooves for your songwriting projects to quickly and easily build new and inspiring drum tracks. Within the 6/8 time signature, you can dig into straight 8th beats, half-time grooves, shuffles, and other 6/8 grooves. Drum Werks XXV is the only exclusively 6/8 time sample collection available anywhere. Each “Groove Set” folder offers main song grooves, groove variations played on each time-keeping source (hi hats open and closed, ride, crash wash) multiple drum fills and fill variations – putting you in complete control to build your drum track quickly and easily. Often imitated but never duplicated, Beta Monkey set the standard for single recording session sample libraries. Drum Werks XXV includes a complete set of matching drum samples (all drums and cymbals used in recording), allowing users to layer drum voices and sequence custom drum tracks. Combine and mix all loops and seamlessly, the ultimate 6/8 sample collection for consistency and versatility. These are 100% live acoustic drums and studio performances – never sequenced or rendered limp by a heavy-handed dose of Beat Detective. Drum Werks XXIV will become an indispensable addition to your songwriting toolkit. Drum Werks XXV is a complete songwriting drum loop resource for multiple styles of rock, alt rock, pop, funk, and RnB – if your drum tracks need 6/8 grooves – that delicious feel and pulse unique to this time signature – this is the only collection you’ll need. Versatile Up-Tempo 6/8 Drum Beats and Fills: Straight-ahead 8th feels, swing feels, implied shuffle feels. Swing and shuffle beats are also included as a bonus. 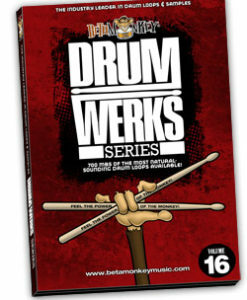 Drum Werks XXV delivers live 6/8 drum loops for rock, pop, alt rock, prog-rock, funk-rock, and RnB. Focused Tempo Range: Powerful and focused coverage of five tempo-based sets: 70 bpm, 75 bpm, 80 bpm, 90 bpm and 100 bpm. No other loop collection matches the versatility and scope of this 6/8 drum loop library. Cohesive Drum Sounds: A Beta Monkey exclusive feature – often imitated, but never duplicated. All Drum Werks XXV drum loops are from a single recording session. Change tempos or mix feels – you can mix any loop or sample in this library. For maximum versatility, Drum Werks XXV 6/8 drum loops are compatible with our slower 6/8 drum loops in the Drum Werks XXIV sample set. Fully-Sampled Drum and Cymbal Samples: An extensive and fully-sampled drum and cymbal sample kit, allowing for layering drum voices and designing your own grooves. Another Beta Monkey sample library innovation. 263 royalty-free loops and samples. 185 (222 MB) multi-velocity drum and cymbal samples. Kick, snare, 3 toms, hihats, ride, multiple crash cymbals allow total flexibility for layering accents and syncopations to the drum tracks. So many drum loop packages are in standard 4/4 timing. When you finally find a collection in 6/8 they are typically geared towards slower ballad riffs. This Up-Tempo 6/8 pack is a breath of fresh air. It truly is a one of a kind package.